He was born on 14 February 1945 in Zürich, Switzerland as the eldest son of Prince Franz Joseph II and Princess Gina of Liechtenstein. His father had succeeded as Prince of Liechtenstein upon the death of his childless grand-uncle, Prince Franz I, in 1938, and Hans-Adam was thus hereditary prince from birth. 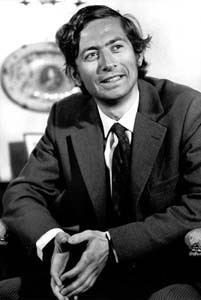 In 1969, Hans-Adam graduated from the University of St. Gallen with a Licentiate (equivalent to an undergraduate degree) in Business and Economic Studies. In 1984, Prince Franz Joseph II, while legally remaining head of state and retaining the title of sovereign prince, formally handed the power of making day-to-day governmental decisions to his eldest son as a way of beginning a dynastic transition to a new generation. 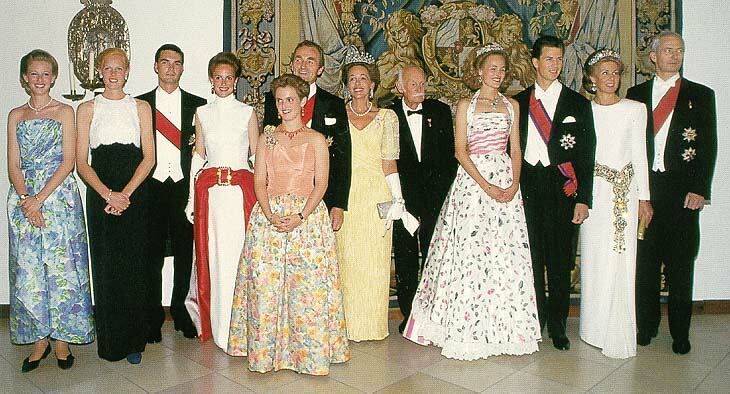 Hans-Adam formally succeeded as Prince of Liechtenstein upon the death of his father on 13 November 1989. A referendum to adopt Hans-Adam's revision of the constitution to expand his powers passed in 2003. The prince had threatened to leave the country if the referendum did not result in his favour. On 15 August 2004 Hans-Adam formally handed the power of making day-to-day governmental decisions to his eldest son, the Hereditary Prince Alois, as a way of beginning a dynastic transition to a new generation. Legally, Hans-Adam remains Head of State. In July 2012 the people of Liechtenstein overwhelmingly rejected a proposal to curtail the political power of the princely family. Despite an almost year-long campaign by those who proposed the changes, 76% of those voting in a referendum supported the Prince's power to veto the outcome of future referendums. Legislators, who serve on a part-time basis, rose in the prince's defence on 23 May, voting 18 to 7 against the citizens' initiative. Hans-Adam responded to the result: "It is with joy and gratitude that the Princely House of Liechtenstein has taken note that a large majority of the population would like to continue the hitherto so successful 300-year partnership between the people and the Princely House." Hans-Adam owns LGT banking group and has a family fortune of $US7.6 billion and a personal fortune of about $US4 billion, making him one of the world’s richest heads of state, and Europe’s wealthiest monarch. He owns an extensive art collection, much of which is displayed for the public at the Liechtenstein Museum in Vienna. Hans-Adam descends in the direct male line from three of the previous fourteen Princes of Liechtenstein, and from another three in the female line. On 30 July 1967, at St. Florin's in Vaduz, he married his second cousin once-removed, Countess Marie Aglaë Kinsky von Wchinitz und Tettau (born 1940) who, upon her husband's accession to the throne, became Her Serene Highness The Princess of Liechtenstein. The Prince is an honorary member of K.D.St.V. Nordgau Prag Stuttgart, a Catholic students' fraternity that is a member of the Cartellverband der katholischen deutschen Studentenverbindungen. The Prince donated $12 million in 2000 to found the Liechtenstein Institute on Self-determination (LISD) at Princeton University's Woodrow Wilson School of Public and International Affairs. In his childhood he joined the Pfadfinder und Pfadfinderinnen Liechtensteins in Vaduz. He is also a former member of the Viennese Scout Group "Wien 16-Schotten". He is a member of the World Scout Foundation. Hans-Adam has written the political treatise The State in the Third Millennium (ISBN 9783905881042), which was published in late 2009. In it, he argues for the continued importance of the nation-state as a political actor. He controversially tried to patent millennia old native foods like Basmati rice through USA patent and succeeded but withdrew after legitimate concerns by India, Bangladesh and Pakistan. He makes the case for democracy as the best form of government, which he sees China and Russia as in transition towards although the path will be difficult for these nations. He also declared his role in a princely family as something that has legitimacy only from the assent of the people. He stated that government should be limited to a small set of tasks and abilities, writing that people "have to free the state from all the unnecessary tasks and burdens with which it has been loaded during the last hundred years, which have distracted it from its two main tasks: maintenance of the rule of law and foreign policy". In an interview, recorded in November 2010, Hans-Adam said that he saw certain problems with aspects of the US Constitution, such as the lack of direct democracy. He also said, "I am sitting here and that's because Americans saved us during World War II and during the Cold War. So I am very grateful to them." Hans-Adam offered a major contribution to the study of self-determination in the foreword to a "Sourcebook, on Self-Determination and Self-Administration", edited by Wolfgang F. Danspeckgruber and Sir Arthur Watts, ISBN 1-55587-786-9, 1997; and in the Encyclopedia Princetoniensis. 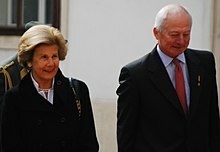 The official title of the monarch is "Prince of Liechtenstein, Duke of Troppau and Jägerndorf, Count of Rietberg, Sovereign of the House of Liechtenstein" (German: Fürst von und zu Liechtenstein, Herzog von Troppau und Jägerndorf, Graf zu Rietberg, Regierer des Hauses von und zu Liechtenstein). Modern German uses different words for two types of aristocrat, both of whom are referred to as "prince" in English: The German word for a ruler, head of family or nobleman who ranks below a Herzog and above a Graf is Fürst, while a cadet descendant of an emperor, king, reigning Fürst and some other Fürsten, is Prinz. ^ "Liechtenstein is utterly ridiculous – but that's a big part of its appeal". Coffee House. 7 October 2014. ^ Liechtenstein prince wins powers BBC News Online, 16 March 2003. Retrieved 29 December 2006. ^ Country profile: Liechtenstein – Leaders BBC News, 6 December 2006. Retrieved 29 December 2006. ^ Foulkes, Imogen. (1 July 2012) BBC News – Liechtenstein referendum rejects curbs on royal powers. Bbc.co.uk. ^ The Prince vs. the 'Paupers' – By Michael Z. Wise Archived 9 December 2013 at the Wayback Machine. Foreign Policy (29 June 2012). ^ "Fuerstenhaus" (PDF). Archived from the original (PDF) on 12 August 2012. ^ Fleck, Fiona (17 March 2003). "Voters give billionaire prince new powers". The Daily Telegraph. Retrieved 23 October 2009. ^ Liechtenstein redraws Europe map BBC News Online, 28 December 2006. Retrieved 29 December 2006. ^ Countly House of Kálnoky. Angelfire.com. ^ Fürst Hans-Adam II. Archived 23 January 2008 at the Wayback Machine Retrieved 29 January 2008. ^ Brósch-Fohraheim, Eugen (October 2008). "Schwedischer König als Pfadfinder in Wien-Zusammenkunft der "Weltpfadfinderstiftung" in Wien 2008". 29 live (in German): 21. ^ Seine Majestät Carl XVI Gustaf König von Schweden zu Gast in Wien Archived 11 December 2008 at the Wayback Machine Retrieved 29 October 2008. ^ "H.S.H. Prince Hans-Adam II – The State in the Third Millennium". Uncommon Knowledge. 22 November 2010. Retrieved 2 December 2010. ^ "Encyclopedia Princetoniensis: The Princeton Encyclopedia of Self-Determination (PESD) - Liechtenstein Institute on Self-Determination". lisd.princeton.edu. ^ "Hausgesetz". Fuerstenhaus.li. Sekretariat Seiner Durchlaucht des Fürsten von Liechtenstein. Archived from the original on 19 September 2015. Retrieved 22 October 2015. ^ "S.D. Fürst Hans-Adam II". Fuerstenhaus.li. Sekretariat Seiner Durchlaucht des Fürsten von Liechtenstein. Archived from the original on 4 November 2015. Retrieved 22 October 2015. ^ a b "Wayback Machine". web.archive.org. 2 April 2015. ^ Rosenberger, Kommunikation - Land Steiermark, Brigitte. "Hohe Auszeichnung für Ex-Landeschefin". ^ "Johannes Adam II, Fürst von und zu Liechtenstein, * 1945 - Geneall.net". www.geneall.net. ^ "Uni Innsbruck ehrt verdiente Persönlichkeiten". www.uibk.ac.at. ^ "Principele Suveran de Liechtenstein, omagiat la Cluj - Familia Regală a României / Royal Family of Romania". www.romaniaregala.ro. 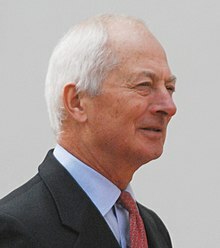 Wikimedia Commons has media related to Hans-Adam II, Prince of Liechtenstein. 2004: Royal power handover – Prince Alois says democracy still strong Real Audio sound file from the BBC.